This 20-Minute BLT Easy Pasta Salad is fresh, fast, SUPER satisfying! 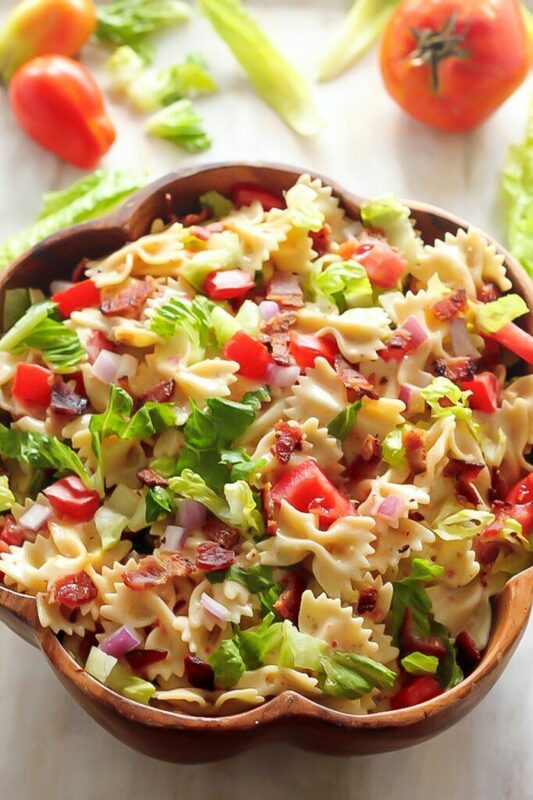 This simple bow tie pasta salad is LOADED with bacon, lettuce, and tomato!!! And then it’s dressed in a slightly creamy – and totally addicting – Zesty Italian dressing. We got back from the beach yesterday, and guess what… I’m beat! After 2 hours of packing up the car, 2 hours in the car, and then – wait for it – 2 hours unpacking the dang car, I felt like I was ready for another vacation!!! Or at least a spa day 😉 Hey… a girl can dream, right? To ease back into the whole real life situation, I decided to take things easy dinner wise and make this incredibly simple 20-minute BLT pasta salad.It’s creamy, dreamy, and just begging to be your dinner! I usually like my pasta salad loaded with a TON of veggies, cheeses, and meats – like this classic Italian pasta salad – but since I wanted something simple and fast, I decided to SHAKE things up and try a new recipe that had been floating around my brain for ages. 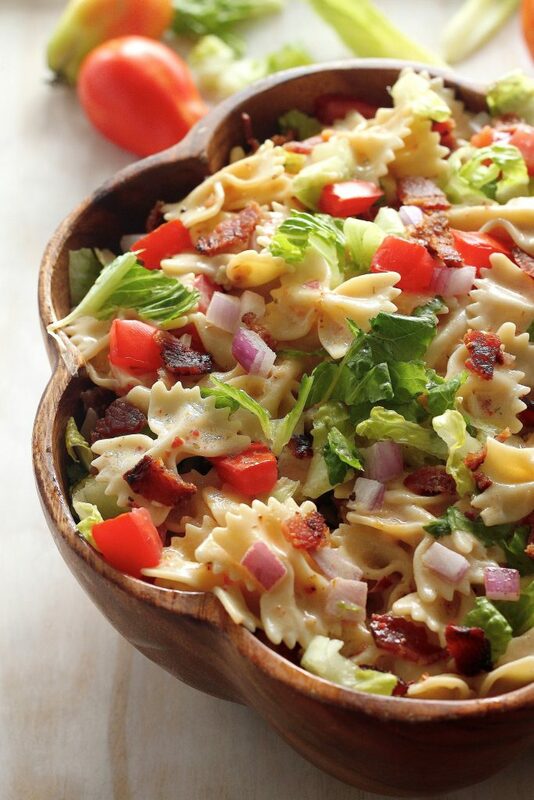 BLT PASTA SALAD. I mean, how could it not be amazing, right? bow tie pasta: aka farfalle! but feel free to use another small noodle in its place! zesty Italian salad dressing: use your favorite brand! creamy Ranch salad dressing: this is my secret ingredient… it adds a subtle creaminess to the pasta salad. trust me!!! thick cut bacon: fried until crispy!!! then cut into strips or crumbled. But I think strips looks prettier. ripe tomatoes: diced! Heirloom tomatoes work great here, but any juicy tomato will work. In a pinch, you can even use cherry or grape tomatoes. crispy romaine lettuce: keyword crispy!!! red onion: diced, this ingredient adds a nice kick. This pasta can be ready to go in 20 minutes, but also can be made up to 8 hours before serving! Perfect for those busy days when you need to make dinner in advance 😉 Just be sure to add the lettuce in right before serving if making ahead of time… otherwise it gets a little soggy and sad. If you have a picnic coming up, or are just looking for a fast, fresh dinner idea, BLT pasta salad has to be on your menu! And with only 7 simple ingredients… I suggest whipping it up TONIGHT! 20 Minute BLT Pasta Salad! Bring a large pot of salted water to boil. Add pasta and cook until al dente, about 10 minutes. Drain pasta and rinse under cold water until cool. While the water is coming to a boil, heat a skillet over medium heat; add bacon strips, and cook until crispy, about 4 minutes on each side. Transfer bacon to a paper towel lined plate. Place cooled pasta in a large serving bowl; set aside. In a small bowl combine zesty Italian dressing and ranch, mix well. Add dressing to pasta and toss well to coat pasta. Add bacon, lettuce, tomato, and onion to the pasta bowl, mix well to combine, and season with salt and pepper as desired. Serve at once, or chill until needed. I would definitely not have thought of putting ranch and Italian dressing together, but this pasta salad sounds and looks delicious! I make a version of this using peppercorn ranch with the Italian. So yummy! And I also add grilled chicken breast for a complete meal. I NEEEED this something BAD! BLT is my fav..and in a pasta! Genius! Pinned! Love this! I totally can relate. I always get back from vacations and feel like I need a vacation from the vacation. This is my kind of dinner! So awesome!! 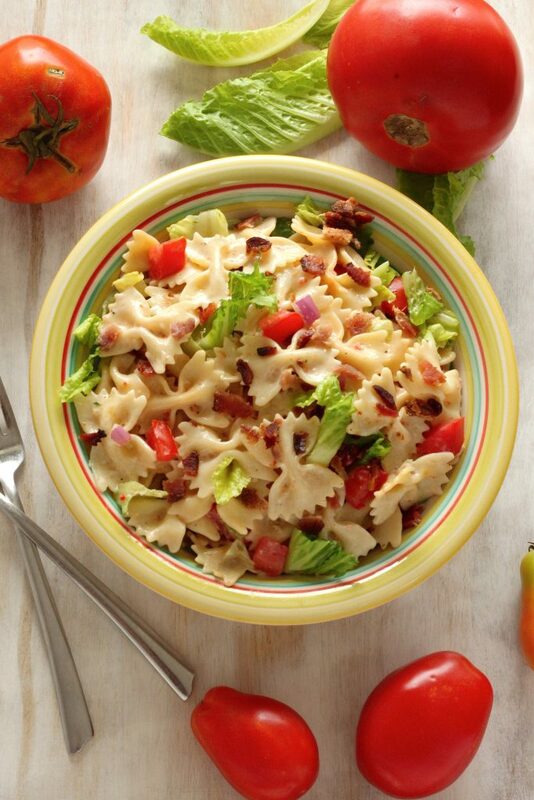 ALWAYS ready for pasta salad, especially a pasta salad with bacon. Yes. That looks amazing & delicious Ashley! Pinned. Love the quick prep time. What a great idea! My little cherry tomato plants are going nuts and this would be perfect for our next salad. I love BLTs (my husband is cooking some bacon for us to have them for dinner as I write this), but never thought of putting them into a pasta salad. Sounds really delicious! Totally get the needing a vacation after the vacation! But girl, this salad looks divine!!! I am drooling all over my keyboard. Why is it that everything tastes better with bow-tie noodles? Is it because they are so cute? IDK but this salad needs to find its way into my dinners this week! Pasta salad is one of my favorite side dishes (and okay, let’s face it, meals!). This looks so flavorful with the zesty dressing and those fat hunks of crispy bacon. Swoonsville over here! I feel like I have lived on BLT’s this summer. Love this pasta salad! Totally my kind of salad!! so much texture and bacon and pasta. freaking love this! What a gorgeous salad! I’m loving all the flavors too. I could totally do a bowl of this for lunch. Awesome! This salad sounds delicious and is so well timed! I’m searching for easy, flavorful recipes now that school is back in session and this sounds perfect! My guys would go crazy for this salad! YESS! I love this idea, Joanne! Totally my kinda salad..and I’m loving your new site look! Love a good BLT pasta! I might make this one for my church potluck this week! I am all about any BLT, just love this and can’t wait to try the new reinvented dressings! This is genius! BLT pasta in 20 minutes, so making this! Ok, now this is the kind of salad I ADORE! Just curious, do you get a reimbursement from Walmart for mentioning that they carry the products you use in the recipe. Those same products can be purchased at just about any store so I am wondering why you specify Walmart? Hi Mary. This was a campaign I did with walmart and Kraft, which is why I mentioned it. There’s a disclaimer at the top of the post. That is such a pretty pasta salad! What a fantastically fresh and simple salad. Love it! This salad looks and sounds amazing but, since my taste buds have never gotten along with onions, I am going to substitute avacado for onions when I make it. Can’t wait, ya gotta love anything BLT! Also, if you don’t like the non-uniformity of crumbled bacon, I always cut mine in narrow slices, from the end of the package, before I cook it. If you put the bacon in the freezer for about 15 minutes before slicing it, it will be more firm and slice easier. You can cut the end of the whole package and your required amount is done in a few slices and they will be nice and uniform! This is my kind of dinner! Perfect salad! This salad was extremely light and delicious, easy to make and absolutely beautiful. I highly recommend it as a suggestion for couples to make on date nights!!! I love your many foods I use quite a lot of them. Keep on cooking especially the pastas . Thank you…!!! About how many people will this serve? I am having a cookout with about 25 people and am wondering should I double the recipe or more? that is what i needed to know…how many will it feed! thanks for replying! This salad was SOOOO amazing! Sorry I waited so long to try it, but it was delicious! Thank you for sharing! We made this for supper tonight and it was amazing. My new favorite salad. I’ll be getting more bacon tomorrow so I can take this salad to a church supper on Sunday. I also shared a link to your page with family and friends. Thanks for sharing this with us. Hi Joel. Thank you so much for this awesome comment! I am so happy to hear you enjoyed this salad, and even happier to know you’re making it again to share 🙂 Have a wonderful night! Tried this last night, as the temp was 90, I needed easy and light and no oven. Did my bacon in the micro, cooked the pasta, chopped the tomatoes, red onion and lettuce on large cutting board. Also diced up some leftover grilled chicken. Mixed the dressings. Called all to dinner, and everyone prepared their own salad. It was a big hit. Will definitely make again. Thanks for sharing. 1/2 cup kraft creamy ranch or you talking about the dressing liquid or powder?? thank you,,baby shower this weekend so use both bottles of liquid bottles and mix them together. Hi, I’m planning on making this for a family cook-out which is two hours away, I was wondering how well it would be if I made it the night before and transport it in the van for two hours? Also to make things faster could you use real bacon bits, if so how much? Thank you, I can’t wait to try this recipe. Hi Julie. If you’re traveling with this dish I really don’t recommend making it the night before as the ingredients may not hold up so well. What I do think you could do is cook the noodles the night before, drain them, rinse them in cold water, and toss them with the salad dressing (so they don’t stick). Then you could just chop up the lettuce, tomato, onion, and bacon, place them in separate bowls, and toss everything together in the morning before traveling. <--- That should only take 5 minutes max. I've never made this using real bacon bits, but I see no reason why they wouldn't work 😉 I would start with 1/3 cup and add more if needed.Have a great time at the cook-out! Could the lettuce be served in a second bowl? My other ingredients filled my going to be salad serving dish full to overflowing. Wow! This is one delicious pasta salad. I found it on a round-up on Country Living Magazine’s site. I’ve made it a few times this summer already and every time people rave and ask for the link to your recipe! Hi Alison! I’m glad I could answer your question via a previous comment 🙂 How did it turn out? this pasta salad was off the chain!! i added some more seasoning like Italian seasoning and Parmesan cheese..it was a hit..
Thanks…I want to make it for my Rummikub luncheon. I have made a similar BLT for years Bow tie, real bacon bits, green onion and tomato. Drizzle olive oil on cooked pasta, add a little garlic powder, blend with mayo….I try my best not to eat it all!! I’m wondering about what the serving size is when recipe is made as written. Hi Sarah. This generously serves 6. Made it this morning. Perfect! Could the lettuce e served separately? My other ingredients, when mixed, fill my, going to be serving bowl, to overflowing. Could the lettuce e served separately? My other ingredients, when mixed, filled my, going to be serving bowl, to overflowing. This looks so unbelievably good! All of my favorite flavors! Packing and unpacking is exhausting! You’re definitelt earned yourself a spa day if you ask me! AND this pasta salad sounds amazing! Anything with bacon sign me up! What an awesome pasta salad! I love the idea of using BLT flavors in it! What an awesome summer recipe! The dressing worked! Great flavor! I made a healthier version that was probably just as good. I used whole wheat rotini, turkey bacon and light ranch dressing.